In the present study, the protective effects of Hizikia fusiforme and Chlorella sp. extracts on lead acetate-induced hepatotoxicity were investigated. Hepatic damage was induced in rats by intraperitoneal (i.p.) 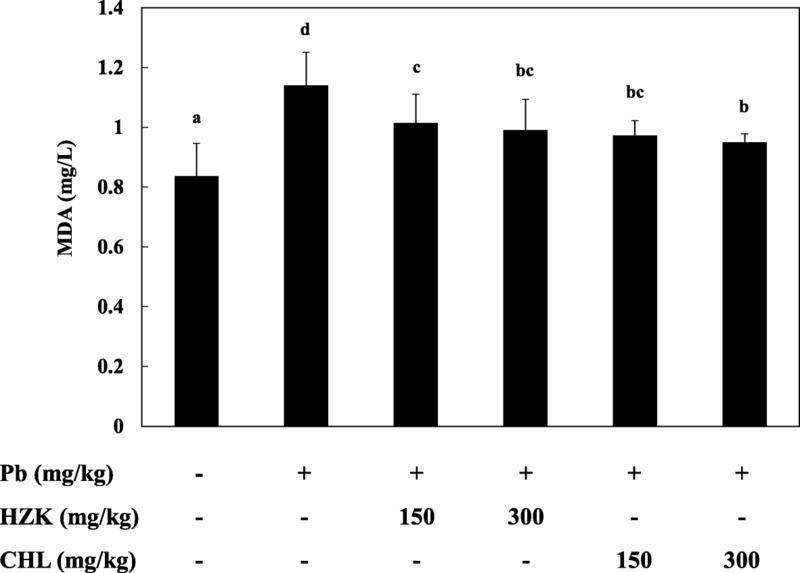 injection of lead acetate and the protective effects of H. fusiforme (HZK) and Chlorella sp. (CHL) extracts on lead acetate-induced hepatic damage in rat liver were examined. The results revealed significantly increased glutamic oxaloacetate and glutamic pyruvic transaminase levels in the group treated with lead acetate only (Pb group); oral administration of HZK and CHL extracts tended to decrease the enzyme levels similar to those observed in the control group. Regarding antioxidant enzymes, superoxide dismutase activity was increased in the Pb group and decreased in a concentration-dependent manner in the HZK- and CHL-treated groups. Glutathione levels were increased in a concentration-dependent manner in the HZK- and CHL-treated groups. There was no significant difference in catalase activity. 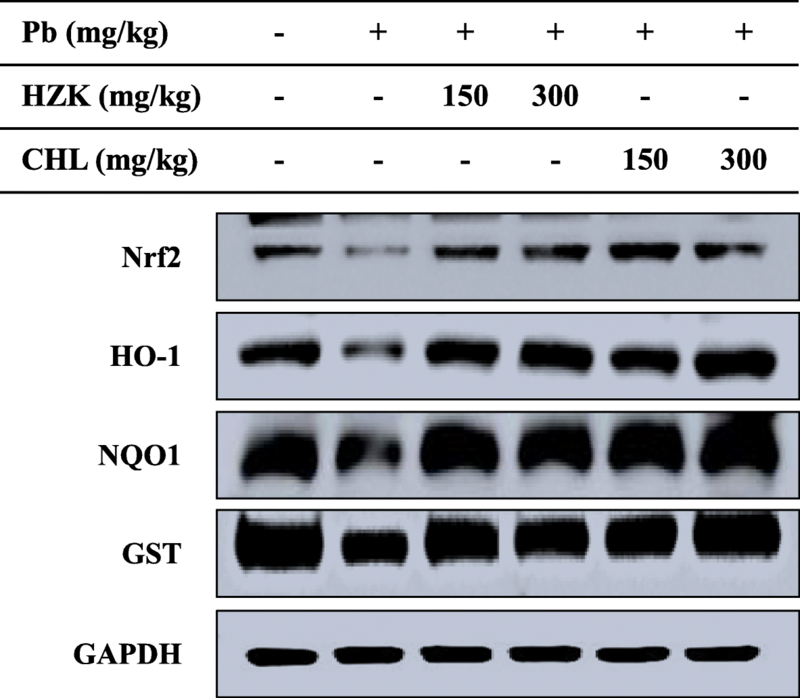 Western blot analysis showed inflammation-related protein expression in mitogen-activated protein kinase and Nrf2 pathways was affected in the HZK- and CHL-treated groups. Therefore, HZK and CHL extracts exerted antioxidant and anti-inflammatory effects against lead acetate-induced hepatotoxicity. Development of functional health foods containing HZK and CHL extracts, which have hepatoprotective effects against inhaled lead acetate, should be considered. The development of industrial technology and the increased number of automobiles and factories cause various types of environmental pollution. For instance, air pollution is of serious concern, as it directly affects human health (Meo and Suraya 2015). Among air pollutants, fine dust causes various diseases. Since dust with small particle size has become a major health hazard, most countries have set environmental standards for particulate matter with a diameter of 10 μm (PM)10 or 2.5 μm (PM2.5) (Hsiao et al. 2000; Zhou et al. 2016). Dust is mainly emitted by automobile exhaust gases and factory chimneys. Heavy metals such as lead, cadmium, zinc, nickel, and chromium contained in fine dust are absorbed into the human body and cause various respiratory and circulatory diseases through different mechanisms, such as the generation of active oxygen species (Donaldson and MacNee 2001). A previous study found that the lead content in fine dust was significantly higher than in soil (Hu et al. 2014). Seaweed is consumed as food in large quantities in Korea, Japan, and China. The carbohydrates contained in seaweed are effective in promoting intestinal motility, heavy metal elimination, and improving hyperlipemia (Lee and Kim 2008; Kim et al. 2011). Hizikia fusiforme is not only a good source of dietary fiber but also fucoidans, in particular jaminaran, a neutral polysaccharide with functional properties such as blood coagulation and immunity enhancement (Wua et al. 2013). Chlorella is a single-celled green alga rich in vitamins and minerals, and is effective in improving overall health and well-being. Chlorella contains a physiologically active substance, chlorella growth factor, which reportedly possesses anti-cancer effects and is effective in child growth and development as well as immune enhancement (Hidalgo et al. 2014). Given this background, we investigated the antioxidative and protective effects and related mechanisms of H. fusiforme and Chlorella sp. on lead-induced hepatotoxicity. H. fusiforme was washed three times with water to remove salt and impurities, cleaned, and dried in a freeze dryer (Eyela, Tokyo, Japan). Dried H. fusiforme was ground into a powder (below 50 mesh) using a food blender (Daesung, Gyeonggi-do, Korea). Chlorella sp. was purchased as 100% Chlorella powder (below 70 mesh) from Novarex Inc. (Seoul, Korea). H. fusiforme and Chlorella sp. powders (40 g) were suspended in 1 L distilled water and stirred for 4 h at room temperature (RT). The suspension was centrifuged at 3000×g (4 °C, 10 min) and vacuum-filtered, followed by the addition of triple volumes (total quantity of filtrate: × 3) of 95% ethanol and remained for 24 h at RT. After that, the solution was filtered (Whatman no.4, GE Healthcare, Buckinghamshire, UK) and concentrated using rotary evaporation at 40 °C. The concentrated solution was distributed into 10 mL tubes and freeze-dried to produce H. fusiforme (HZK) and Chlorella sp. (CHL) extracts, which were stored at − 70 °C until use (Fig. 1). Extract protein contents were measured by protein quantification in a Bradford assay. To quantify protein concentration, 1 mg of extract powder was dissolve in 20 mL distilled water and 20 μL of dissolved extract were incubated with 180 μL of Bradford reagent at RT. The absorbance at 595 nm was read after 5 min. The results showed that the protein content of H. fusiforme extract was 54.1% and the Chlorella sp. extract was 57.4%. Extract carbohydrate contents were measured by phenol-sulfuric acid method. One milligram of extract powder was dissolve in 20 mL distilled water and 0.5 mL of dissolved extract was mixed with 0.5 mL of 5% phenol solution. After that, 2.5 mL sulfuric acid was added for 30 min. The absorbance was determined under the 490 nm. The results showed that the carbohydrate content of H. fusiforme extract was 19.1% and the Chlorella sp. extract was 22.6%. The animals used in the experiment were 6-week-old male Sprague-Dawley (S.D.) rats purchased from Samtako (Osan, Korea), pre-fed for 7 days, and adapted to the environment. The animals were kept in a stainless-steel cage at a temperature of 22 ± 2 °C and humidity of 45 ± 5% and subjected to a 12 h light/12 h dark cycle. The rats were fed a regular solid food diet and water ad libitum. Animals were randomly divided into six groups (n = 7, each group) and the animal experiment was designed to last 10 days. The rats in the control (CON) group were administered an intraperitoneal (i.p.) injection of 0.5 mL saline solution (0.9% NaCl) daily for 10 days. The rats in the lead acetate (Pb) group were administered an i.p. injection of 0.5 mL lead acetate (25 mg/kg body weight) for the final 5 days of the experimental period. The rats in the HZK groups were orally administered 150 or 300 mg/kg body weight of HZK (HZK 150 and HZK 300 groups, respectively) for 10 days. Rats in the CHL groups were orally administered 150 or 300 mg/kg body weight of CHL (CHL 150 and CHL 300 groups, respectively) for 10 days. The rats in the HZK and CHL groups were administered an i.p. injection of 0.5 mL lead acetate at a dose of 25 mg/kg body weight for the final 5 days of the experimental period. At the end of treatment, rats were fasted for 12 h, and then anesthetized with ether and sacrificed by decapitation. Blood samples were collected from the sacrificed animals and left on ice for 30 min before centrifugation. Livers were immediately washed using chilled saline solution, photographed, frozen in liquid nitrogen, and stored at − 70 °C. Glutamic oxaloacetate (GOT) and glutamic pyruvic transaminase (GPT) activities were measured using the GOT and GPT kit according to the manufacturer’s instructions (Asan Pharm, Seoul, Korea). The absorbance was measured at 505 nm using Synergy™ HTX and Synergy™ 2 Multi-Mode Readers (BioTek, Winooski, VT, USA). The liver tissue was assessed for liver peroxidation using the thiobarbituric acid reactive substances (TBARS) assay kit according to the manufacturer’s instructions (Oxford Biochemical Research, Auckland, New Zealand). The absorbance was measured at 532 nm using Synergy™ HTX and Synergy™ 2 Multi-Mode Readers (BioTek, Winooski, VT, USA). The superoxide dismutase (SOD) and catalase (CAT) activities, as well as glutathione (GSH) levels, were assessed in the liver homogenates. SOD was measured using the SOD assay kit according to the manufacturer’s instructions (Cayman, Ann Arbor, MI, USA). The absorbance was measured at 450 nm using Synergy™ HTX and Synergy™ 2 Multi-Mode Readers (BioTek, Winooski, VT, USA). CAT was measured using the CAT assay kit according to the manufacturer’s instructions (Cayman, Ann Arbor, MI, USA). The absorbance was measured at 540 nm using Synergy™ HTX and Synergy™ 2 Multi-Mode Readers (BioTek, Winooski, VT, USA). GSH levels were measured using the GSH assay kit according to the manufacturer’s instructions (Cayman, Ann Arbor, MI, USA). The absorbance was measured at 405 nm using Synergy™ HTX and Synergy™ 2 Multi-Mode Readers (BioTekm, Winooski, VT, USA). Liver tissue (50 mg) was homogenized in RIPA lysis buffer and centrifuged (12,000×g, 4 °C, 20 min) to obtain the supernatant. Protein concentration was measured using a BCA protein assay kit (Pierce Biotechnology, Rockford, IL, USA). The same amount of protein was added at 50 μg/lane, mixed with 5× sample buffer, boiled in a water bath, and loaded on 7.5%, 10%, and 12.5% sodium dodecyl sulfate polyacrylamide gel electrophoresis gels. Standard molecular weights were measured using a dual color marker and transferred to a polyvinylidene difluoride membrane (Millipore, Billerica, MA, USA). The membranes were incubated with primary antibody (Santa Cruz Biotechnology, Inc., Santa Cruz, CA, USA) at room temperature for 2 h, washed twice with TBS-T [10 mM Tris-HCl (pH 7.5), 150 mM NaCl, and 0.1% Tween 20] (USB, Cleveland, OH, USA) for 15 min, and then diluted at a 1:10,000–5000 ratio for the second antibody (Santa Cruz Biotechnology, Inc., Santa Cruz, CA, USA). The membranes were washed twice with TBS-T for 15 min and then analyzed with a fluorescent gel image analyzer (Azure Biosystems, Dublin, CA, USA) using SuperSignal West Pico Luminol/Enhancer solution and SuperSignal West Pico Stable Peroxide solution (Pierce Biotechnology, Rockford, IL, USA). The protein expression level was confirmed by scanning the band. The results were expressed as the mean and standard deviation (SD) for each group. All data were analyzed using SPSS software (IBM, Armonk, NY, USA) for Windows. Analysis of variance was used to identify differences between the experimental and control groups, and Duncan’s multiple range test was used to test the significance of each group. All statistical significance levels were assessed at P < 0.05. The rat livers in the CON group were red with a normal shape and shiny surface. In the Pb group, the livers showed a slight ashy coloration. Conversely, the color of rat livers in the HZK 150, HZK 300, CHL 150, and CHL 300 groups were similar to those in the CON group; no concentration-dependent change was observed (Fig. 2). GOT activity was significantly increased in the Pb group compared with the CON group and decreased in a concentration-dependent manner in the HZK 150, HZK 300, CHL 150, and CHL 300 groups compared with the Pb group. GPT activity was significantly increased in the Pb group, whereas the HZK 150, HZK 300, CHL 150, and CHL 300 groups showed less GPT activity than the Pb group (Fig. 3). The Pb, HZK 150, HZK 300, CHL 150, and CHL 300 groups had elevated TBARS levels compared with the CON group. The HZK 150, HZK 300, CHL 150, and CHL 300 groups showed decreased TBARS levels compared with the Pb group (Fig. 4). H. fusiforme and Chlorella sp. extracts significantly decreased TBARS levels and prevented lipid peroxidation caused by lead acetate (Newairy and Abdou 2009; Li et al. 2015a, b). The Pb, HZK 150, HZK 300, CHL 150, and CHL 300 groups showed significantly increased SOD activity compared with the CON group. SOD activity in the HZK 150, HZK 300, CHL 150, and CHL 300 groups decreased in a concentration-dependent manner compared with the increased SOD activity in the Pb group (Fig. 5a). The Pb group showed decreased CAT activity compared with the CON group and the CAT activity in the HZK 150, HZK 300, CHL 150, and CHL 300 groups was slightly, but there was no significant difference between each group (Fig. 5b). he Pb group showed significant decreased GSH activity compared with the CON group. GSH levels reduced due to lead acetate-induced liver damage which was significantly increased in a concentration-dependent manner in the HZK 150, HZK 300, CHL 150, and CHL 300 groups (Fig. 5c). The mitogen-activated protein kinase (MAPK) pathway is responsible for a variety of cellular functions, such as cell signaling (Obata and Noguchi 2004). ERK is the first known MAPK pathway and is important for cell mitosis, differentiation, proliferation, and survival. p38 is engaged in cellular stress and inflammatory responses (Widmann et al. 1999). 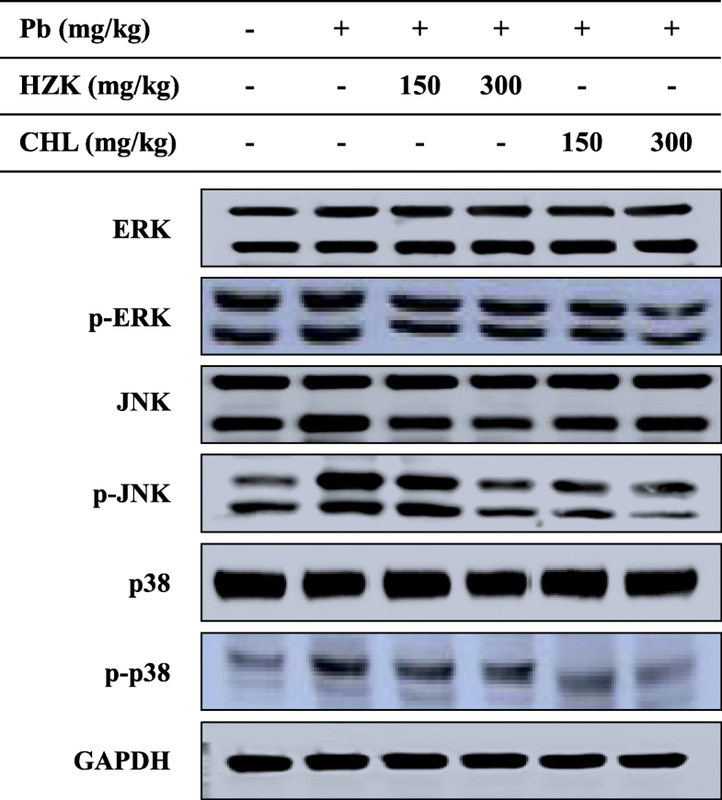 The phosphorylation of ERK, JNK, and p-38 in the MAPK pathway was confirmed and decreased in the HZK 150, HZK 300, CHL 150, and CHL 300 groups compared with the Pb group (Fig. 6). Phosphorylation of I-κB, an inflammatory response-related intracellular enzyme complex, inducible nitric oxide synthase (iNOS), and cyclooxygenase-2 (COX-2), an inflammatory protein, showed decreased expression in the HZK 150, HZK 300, CHL 150, and CHL 300 groups (Fig. 7). Activation of the Nrf2 pathway contributes to inflammation control, antioxidant, drug resistance, and cancer-related functions. When activated by external stress [e.g., reactive oxygen species (ROS), carbonyls, hydroperoxides, and quinones], Nrf2 migrates into the nucleus and binds to the antioxidant response element (ARE) to express antioxidant and detoxifying enzymes such as NQO-1, HO-1, and glutathione S-transferase (GST) for cell protection (Li et al. 2015a, b). In this study, Nrf2 expression was increased by treatment with HZK and CHL. The expressions of NQO-1, HO-1, and GST were also increased (Fig. 8), and oral administration of HZK and CHL exerted protective effects against oxidative stress and inflammation in rats. Various nutrients and functional characteristics of seaweed have been demonstrated. Research on various properties such as antioxidant, anti-inflammation, anti-cancer, and diet is being conducted for functional health foods using bioactive substances of seaweed (Bocanegra et al. 2009). H. fusiforme contains calcium, iodine, iron, and is especially abundant in minerals. In addition, H. fusiforme has been used to study hepatic enzyme activity and recovery from oxidative stress (Kim and Kim 1998). Chlorella sp. contains a significant amount of chlorophyll and various nutrients (Singh et al. 1998). Numerous recent studies have highlighted the biological functions of Chlorella sp., such as excretion of heavy metals in organisms (Pairat and Qiming 2001), anti-inflammation effects (Dao et al. 2001), and anti-cancer effects (Justo et al. 2001). In this study, the effects of H. fusiforme and Chlorella sp. extracts on liver damage and oxidative stress in lead-induced hepatotoxicity were investigated. 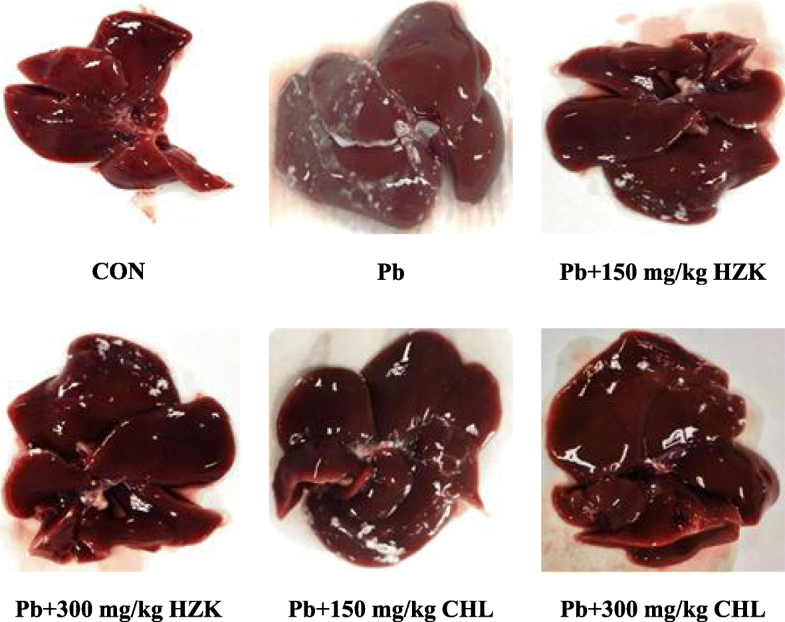 First, to confirm hepatotoxicity, analysis of GOT and GPT activities was performed, as blood biochemical indicators of lead-induced hepatotoxicity. In the HZK 150, HZK 300, CHL 150, and CHL 300 groups, the GOT and GPT enzyme activities showed recovery compared to the Pb group, indicating that HZK and CHL inhibited cell destruction caused by lead. Lipid peroxidation is caused by oxidative stress reactions in lead-induced hepatotoxicity (Johny et al. 2010). Lipid peroxidation (TBARS) was significantly higher in the Pb group than in the CON group, and decreased in a concentration-dependent manner in the HZK 150, HZK 300, CHL 150, and CHL 300 groups. This reduction in lipid peroxidation indicated that the administration of HZK and CHL prevented oxidative stress caused by lead-induced damage in liver tissue. SOD plays an important role as a superoxide radical scavenging enzyme (Fukai and Ushio-Fukai 2011). In this study, injection of lead acetate induced an abnormal increase in SOD activity in the Pb group compared with the CON group. The increase of SOD activity in the Pb group was considered a defense mechanism due to increased oxidative stress caused by the injection of lead (Carla et al. 2017). High SOD activities facilitate the conversion of superoxide anion (O2−) into hydrogen peroxide (H2O2) (Park et al. 2007). In the HZK 150, HZK 300, CHL 150, and CHL 300 groups, the decreased, concentration-dependent SOD activity was attributed to suppressed production of ROS by oral administration of HZK and CHL, resulting in suppressed oxidative stress (Kim and Lim 2005). CAT is an antioxidant enzyme that protects against cellular damage by reducing H2O2 into water and eliminating ROS free radicals. CAT also maintains cell homeostasis and prevents oxidative damage (Wang et al. 2013). In a recent study, significant differences in CAT activity were not observed. GSH acts as a substrate for the glutathione peroxidase and GST antioxidant enzymes, which removes highly reactive toxic metabolites and assists in cellular antioxidant defense (Yang et al. 2013). In the present study, GSH levels in rat liver were significantly decreased in the Pb group, but recovered with oral administration of HZK and CHL in a concentration-dependent manner. The GSH levels in the HZK- and CHL-treated groups were higher than in the CON group due to the reduction in H2O2 levels caused by lead administration. MAPKs are a family of serine/threonine protein kinases that mediate fundamental biological processes and cellular responses to external stress signals (Cargnello and Roux 2011). Increased activity of MAPKs, in particular p38, and their involvement in the regulation of the synthesis of inflammation mediators at the translation and transcription levels, renders them potential targets for anti-inflammatory therapeutics (Bozena 2005). In this study, injection of lead acetate induced phosphorylation of ERK, JNK, and p38 proteins. However, ERK, JNK, and p38 phosphorylation were decreased when HZK and CHL were orally administered. Furthermore, NF-κB is a downstream signaling transcription factor in the MAPK pathway that produces cytokines and promotes development of cancer, inflammatory responses, and apoptosis (Didonato et al. 2012). iNOS is transcribed by NF-κB and promotes the production of NO, which is involved in inflammation and immune responses (Liu et al. 2014). In particular, iNOS expression inhibits antioxidant enzymes (Aktan 2004). COX-2 is an enzyme induced by several types of stimuli and is involved in inflammatory diseases and tumorigenesis by producing prostaglandins, which cause inflammation and pain (Moon et al. 1998). I-κB phosphorylation was significantly increased after injection of lead, and confirmed the effects of H. fusiforme and Chlorella sp. extracts. Expression of iNOS and COX-2 was inhibited in the HZK 150, HZK 300, CHL 150, and CHL 300 groups. 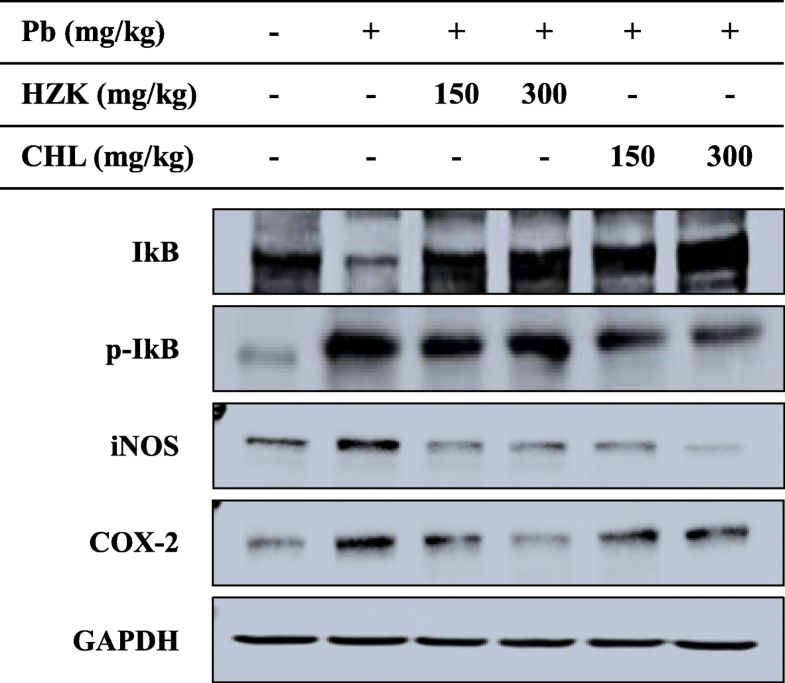 Therefore, oral administration of HZK and CHL regulated the expression of iNOS and COX-2 by inhibiting the NF-kB transcription factor, thereby confirming the inflammatory reaction caused by lead administration is regulated. Activation of the Nrf2 pathway contributes to inflammation control, antioxidant, drug resistance, and cancer-related functions. When activated by external stress (e.g., ROS, carbonyls, hydroperoxides, and quinones), Nrf2 migrates into the nucleus and binds to AREs to express antioxidant and detoxifying enzymes such as NQO-1, HO-1, and GST for cell protection (Murakami and Motohashi 2015). The expression of Nrf2, HO-1, GST, and NQO-1 was increased in HZK 150, HZK 300, CHL 150, and CHL 300 groups. Therefore, H. fusiforme and Chlorella sp. extracts exerted antioxidant and anti-inflammatory effects against lead acetate-induced hepatotoxicity. 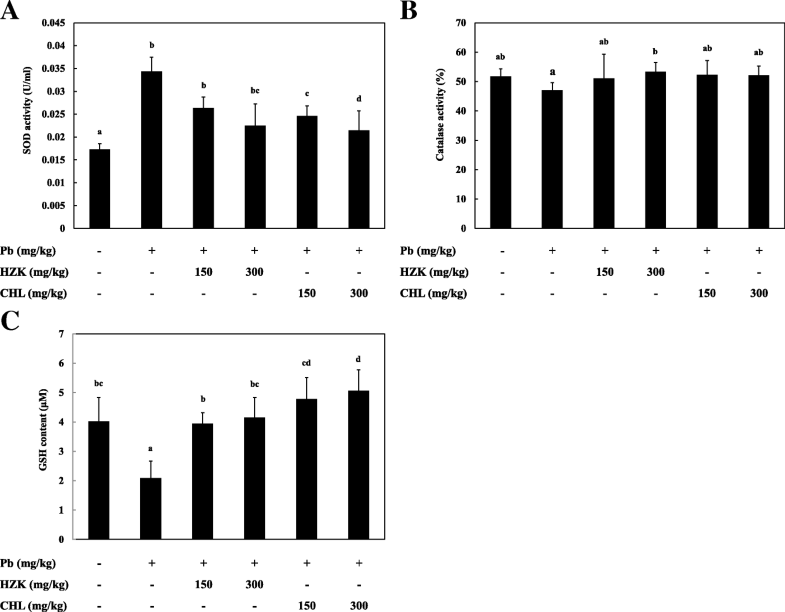 The development of functional health foods with hepatoprotective effects after lead intake using H. fusiforme and Chlorella sp. extract should be considered. This study was supported by Pukyong National University grant no. C-D-2017-0360, Busan, Republic of Korea. JHP designed this study and drafted the manuscript. JWC, MKL, YHC, and TJN conceived and designed the study, and also revised the manuscript. All authors read and approved the final manuscript. Animal experiments were performed according to the institutional guidelines for the care and the use of laboratory animals, and the protocol was approved by the ethics committee of Pukyong National University (Approval No. 2017-34).